If you were born into this numbers vibration, you’re on a personal journey to create safe spaces for the people close to you. Your highest path will lead you through kinship and caring, for people and the world. In Numerology, the Number 6 represents harmony, creativity, and loving service. As a person, you thrive anywhere you can actively support the welfare of others, creating safe havens for them to heal and grow. You’re focused on justice and have a strong sense of personal and collective responsibility. You have an acute awareness of what others need to blossom into their best selves, and want nothing more than to make it so! The generous, protective, maternal path you find yourself walking, is what the world most needs of you, so it’s important that you embrace your Numerology and live the life of your highest potential. Never one to close a door, you keep your home open and available as a sanctuary to whoever needs a safe space to stay and be witnessed. Offering shoulders to cry on, a sanctuary to snuggle into, and creative solutions for every tricky scenario, you’re a haven for SO many people! But this requires true emotional intelligence on your part – you’re not a push-over and have the innate ability to see directly into the heart of the matter. Your gifts go beyond empathy because of your pragmatic, practical mind. And you are who you are out of love – you truly DO love humanity and want everyone to have their chance to succeed. You have high standards – for yourself and others – and believe everyone should put 100% in, all of the time. Ultimately, yours is a number of creativity. As the 3 doubled, you contain the creative essence of this childlike number, though, over time, you may forget it as the weight of responsibilities grow. For this reason, it’s vital that you, Life Path 6, remember to lighten up, have fun, seek pleasure and enjoy life! This is where you’ll find true meaning. Resist simply straining to make everything turn out for the best… sometimes the “best” may not look how you think it should. The Number 6 has a perfectionist streak. Walking this path through life, it’s likely you’ve carried this tendency with you since birth, and anything less than perfect isn’t quite good enough in your world. But not only can this lead to disappointment and criticism – of the self, and others – but exhaustion, as you steadily work yourself into the ground. Self-righteousness can rise for sixes who believe they’re the only ones capable of keeping to necessary standards, especially when it comes to the home environment, which is always your domain. Your desire to be of service in any and every way possible can also be exhausting. Physical and emotional burn out is not uncommon for number 6s so it’s vital you learn to put proper boundaries in place and protect your own energy. Others will take advantage of your kindness and generosity if you let them. But remember, you cannot give from an empty cup, so seeking the balance between service and self-care is critical if you are to master the gifts of the Life Path Number. SOme sixes worry that time away from their duties is self-indulgent and a negative, unhelpful use of their time. Not true! Other people see you as an example, so care for yourself as you care for them. Be careful, also, Number 6, that your desire to help others doesn’t become enabling. You’re an exceptionally kind person, but blind service can actually perpetuate needy behavior, if you’re not actually helping others to help themselves. It’s also easy for some 6s to become so wrapped up in duty, that their creativity suffers. This is a death-knoll to the wellbeing of these artistic folk, so you must give yourself the time and space to replenish your creative reserves, and express yourself freely, outside of the realms of responsibility. Relationships with you, Number 6, will always be full of caring, sharing and romance. With family as your number 1 priority, you’re always committed and dedicated, looking ahead to the future and planning accordingly. You make a safe and devoted partner, but you’re not lacking the fun factor! In the right love match, you and your partner will take center stage of the social scene – hosting the best parties and gatherings, you’re the ones who know how to please a crowd! It’s likely you really need a partner who’s as invested as you are in the long term, but you’re also more than able to hold the fort, if your partner needs more freedom. Just be sure that your roles are clearly enough defined, and that you also get the space and respite you need from the responsibilities of long-term relationships and family. Who do you share the Number 6 with? 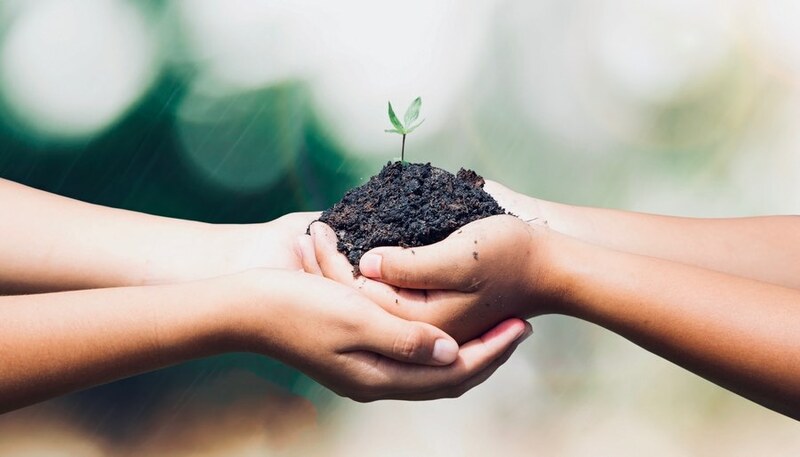 Salma Hayek, Jessica Alba, Michael Caine, Francis Ford Coppola and Michael Jackson are just a few of the rich and famous that you share this highly caring and generous Life Path with! 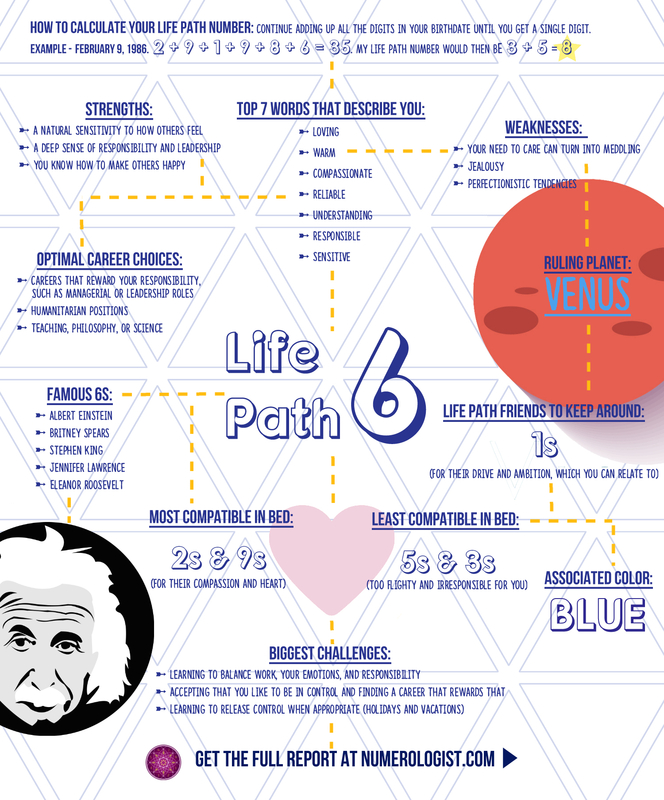 Free Life Path Number 6 Infographic!